I haven't painted much Warhammer Fantasy recently. I pretty much gave up after eighth edition started as I wasn't sure how the new edition was going. I have started listening to the podcast recently and by accident I also started painting some Beastmen at the same time. So it seems that its a simultaneous production! My first model completed has been an old Albion Giant, who I intend to use as a standard giant. He is far from impressive in terms of stature but he is a cool characterful model! I might manage to finish a chariot this week and I will pop up some photographs when I do. Great podcast by the way. I am looking forward to episode 11. Hey, redmanphill, thanks for sharing the pictures of your Giant! I'm a big fan of that particular model, I love the skinny limbs and the expression on his face. You've done a nice job painting him up. Also, the base looks fantastic! What different basing materials do you use? I have always liked that model. I will pop up a step by step basing guide sometime soon! Nice! I like how you gave him Gor weapons. I've always loved those Ungors as well - the heads are great! He got Gor weapons as I had no Ungor ones left. For the life of me I have no idea how I could have used them all. 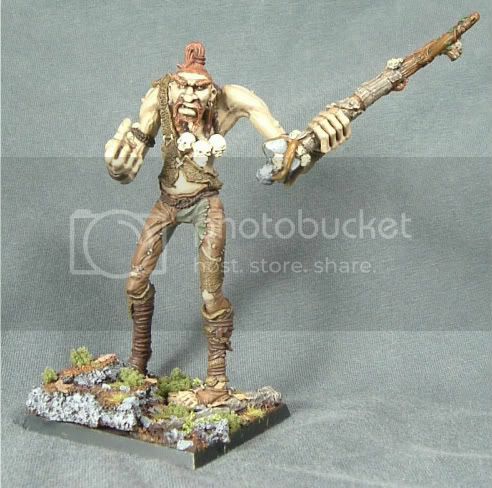 Nice giant, love the old sculpts. 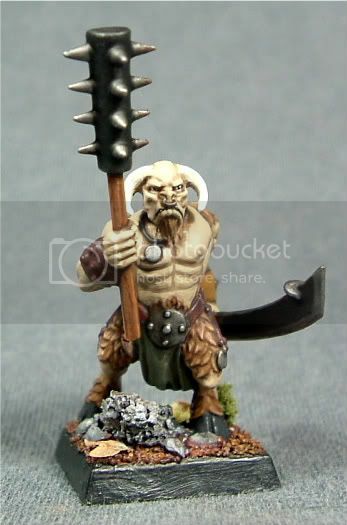 I really like your skin tone on the Ungor, way better than the pinkish GW Beastmen of late. Also how do you paint the eyes? Black and then white dots on the side, or white and one black dot in the middle? I paint 'em with a black to cover the entire eye, then a smaller white circle and finally finished with a black dot. If the shading on the skin is dark enough I skip the first black stage. I just make sure to get the lids underneath painted up in that case and that makes the eyes pop. Here are my Ungors done. The standard is currently drying so he will be up soon too. Nice to see things taking shape finally. I have some Gors done and maybe by next week I can show their progress too. The whole unit looks excellent. The bases in particular really make the unit stand out! Did you paint the banner separate from the pole? They look all ready to go defecate on something ;-) Nice work! Superb painting and great bases really let this unit shine. 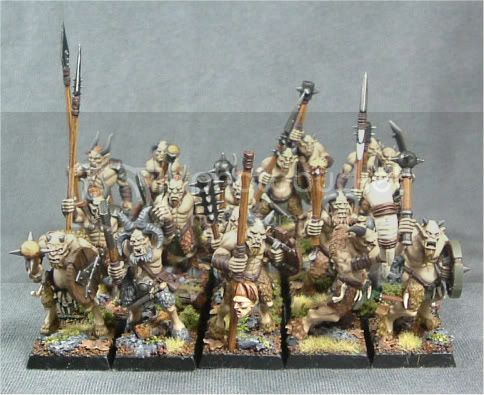 Makes me want to paint up my Beastmen (and go defecate on something :-p). Yep the banner was painted still attached to the sprue in this case. I cut of and cleaned most of the connection points but left those on the cross pole attached. Made it much easier to paint than having it on the model. I have a basing tutorial for my style of forest bases here if you are interested still. Really nice models. I love that old giant. (I have the set, and his brother is tagged for my fimir army) Your basing is frankly, magnificent, and really pushes the models a level higher. It sits very will with the natural palette you're using, and this army is going to be fantastic on the table. 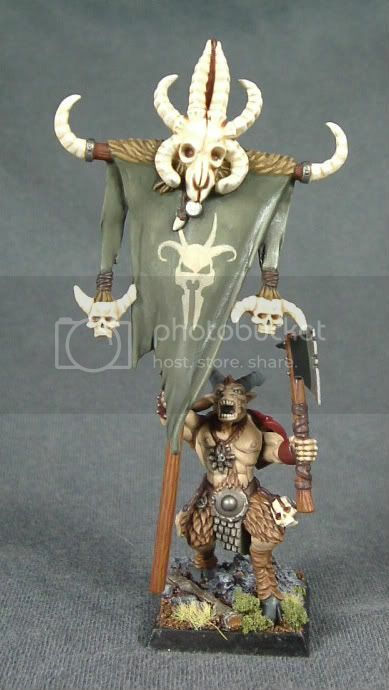 Here are the two banners I have completed so far. I kept the designs simple as I am not that good with freehand. I think they came out decently enough. Tha camera is washing the white out a little on top so there is a lot more contrast on the standard tops than is apparent in the shot. Wwell the basing isn't too hard to emulate. Just getting the materials is all you really need to do! Thanks for the compliment though.